There was all kinds of work to be had around Cincinnati during the war, for it had quickly become the major east-west military rail center in the US, with thousands of troops arriving and departing in every direction to postings in the east, south and midwest. And every one of them had a three-day pass. So Cincinnati also became known as the Red Light District of the West…even though all the sinful action actually took place at towns across the Ohio River in Kentucky, especially Newport. There was a reason for this that exists today, as I learned when I moved to next door Covington in 1989 to be closer to an international airport. Cincinnati was (is) the dullest city in America, under-girded by generations of German-Catholic immigrants going back to the Civil War. Mark Twain once commented that if he found out that the world was coming to an end on Monday, he wanted to be in Cincinnati, because it would take them an extra two weeks to learn it had happened. I spent hours walking the downtown business district, and never once saw a man slap another man’s back, and laugh. Or even smile. Indians (in India) called this the “thousand yard stare” where Englishmen would never look right or left when walking among Natives, avoiding every kind of eye contact. So it only made sense that all the fun-loving, partying, drinking, whoring, would move across the river and state line. Besides, that’s how organized crime had it figured, too. Newport was still largely “owned” by mafia interests-turned-legit, when I lived there, with the main street bars a shadow of their former selves from the war days. Old Ciudad Juarez, across the walking bridge from El Paso, was something like that in the 60s, I suppose, but I’m getting ahead of myself. Bored with life in Little Appalachia, as Hamilton was called, Aunt Betty took work in Newport for the duration of the war, then moved to Detroit afterwards. My dad never “explained” Aunt Betty to me until my college days, but by the time I was in high school I figured out her profession on my own. She was the most beautiful, glamorous woman I’d ever seen, with bright dresses and hats, which shined ten times brighter than the Pentecostal greys people in the mountains wore. She stood out. And I never saw her without high-heels, except the one time I saw her in the altogether, changing clothes, while spending the night with her and “Uncle” Johnnie, or whoever, when I was 6. That was in Detroit and Mom and her sisters had all been called there because their dad was in the hospital, so I was passed around for three nights. Betty’s men were always “Uncle”, but always different, at least three I can recall. As I said, Betty was the most beautiful woman I’d ever seen, and she was a blond when I was 6, so my favorite. 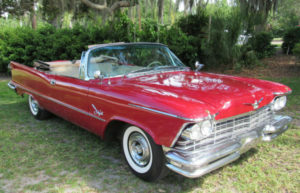 In later years, she would come back to Harlan County, every 2-3 years, always in the summer, and always with a new Chrysler convertible with top down, jeweled sunglasses and hair to match the color of the car…blonde, red, or pink. Horn blaring, she always brought treats and presents. It was like someone had thrown open the shades to light our house. And once she brought a husband, Frankie, I think, I can’t recall, but I think they were all mobbed up and all had greasy, wavy hair. But she was forever blonde in my mind. I never saw an image of that iconic pic of Betty Grable that I did not think of my Aunt Betty. I was sixteen the last time I saw Betty, but amazingly, she and Mom kept a steady correspondence going until she died in the mid-90s, in Florida. Mother was one of the most down-the-nose self-righteous women I had ever known, but for some reason she saw something in Betty no one else did. Their letters were long, multi-paged affairs, and I never heard Mom speak a single doubting word against her. Ever. What each one of those two very different women felt about the other served as great lessons for me which I’ve carried forward all my life, for I am sure each made the other better. And it began a long life of generally looking for something better in people who were otherwise defined by the class they carried on the end of their tongues, the color of their hair, the way they walked down the street looking like some stray cat getting fed, or the way they earned their livelihood, with no visible means of support. I assume they are all diamonds in the rough unless they prove otherwise.